In the annals of history, SFC Global Commodity shall always be remembered for its pioneering work with aluminium. Drawing on it's core vision of value addition through innovation, our contribution to the steel industry is a step in the right direction. On acccount of it's high oxidizing properties, aluminium in it's various forms has traditionally been used in the steel manufacturing process. 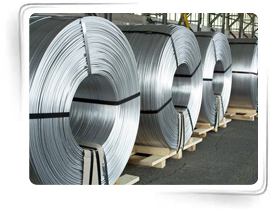 Aluminium in it's various forms like ignots, nautch bars, wire rod etc is added directly to molten steel in the furnace. These forms of aluminium however did not provide effective penetration and thus the core of the molten steel in the furnace remained untouched. To remedy this, more aluminium was used thus increasing costs. Lower costs... and all this translated to a high bottom-line. Although the concept in itself was not entirely new, no other manufacuting units could continuously and profitably provide aluminium wire rods of various specifications to these steel plants. Thus to SFC Global Commodity goes the credit of not only providing the solution but also for providing the means to ensure the implementation of the solution.